A look at archaeological fraud. We tend to think of fake antiquities as being a problem created by the illicit trade in cultural objects. When there is no archaeological find spot, no context, and no ‘chain of custody’ from the ground to the museum, you lose the ability to assert that an artefact is everything that you think it is. It is very true, this is how most fakes creep into the record. It isn’t just a fraud on the buyers (who shouldn’t be spending their money on unprovenanced antiquities anyway), it is a fraud on the public whose past is being confused by false info. Yet, there is an interesting (and much rarer) form of faking: archaeological fraud. Fakes created or planted by archaeologists. I’m going to tell a few archaeological fraud stories here, but I wonder if it would be interesting to evaluate these events from a white collar crime perspective. The last thing I need to do right now is half-start yet another criminology paper (I need to all-the-way finish the ones I have), but let’s just say these rare cases of archaeologists as white collar criminals are kicking around in my brain space. Dumbuck crannock, on the Firth of Clyde near Dumbarton Rock, is a layered platform with associated dock that was built sometime between 200BC and 200AD. The site was excavated in 1898 which revealed such exciting finds as 27 oak stumps forming a large circle which had a timber floor and a large oak dug-out canoe/boat. The boat is real. The artefacts found within it, well, that is another story. The site was discovered by artist and archaeology enthusiast William A. Donnelly as he walked along the Clyde foreshore specifically looking for archaeological sites. 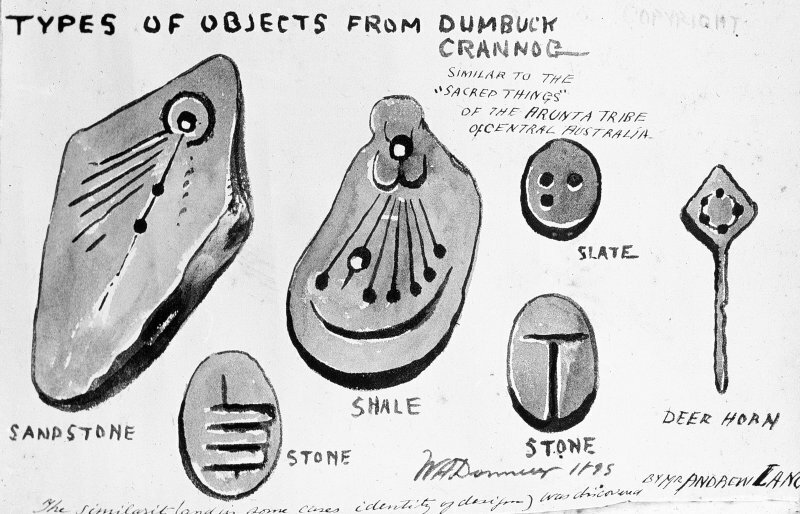 Donnelly, as a member of the Helensburgh Society, had participated in a number of archaeological excavations and his drawings of these are pretty spectacular. In 1895, Donnelly and the society excavated at Dumbowie Dun (also called Dumbuie; near Dumbarton Rock and Dumbuck crannog). There excavators found a series of small finds that could only be described as unusual: arrow-shaped slates with incised lines and rock slabs with holes. Nothing like them were known from other ancient Scottish sites. 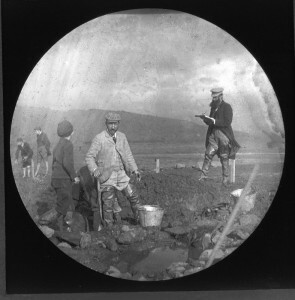 The Dumbuck dig was co-directed by Donnelly, John Bruce (who later became the VP of the Society of Antiquaries of Scotland), and Adam Millar. All three men were involved with Dumbowie as well. During the excavation of the boat quite a few small finds were recovered. They were exactly like the Dumbowie finds and were excavated on different days by different people. Again they were mostly stone but this time some of them were incised shell with crazy little faces. The general public who, because of Donnelly’s promo efforts, were treating visiting the excavation as a great day out, were intrigued. Other Scottish archaeologists were not so impressed. Lines were drawn over the Dumbuck finds. The prominent archaeologist Dr Robert Munro was the lead voice in dismissing the odd carvings as modern fakes. He and the Helensburgh society co-directors got into quite a public fight in the letters pages of the Glasgow Herald through 1899 but eventually the controversy died down for a few years. 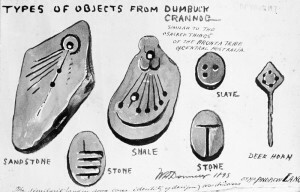 Yet in 1901 and 1902 excavations at another crannog, Langbank, produced a few more of the dubious objects. John Bruce led these excavations under the auspices of the Glasgow Archaeological Society and he had gone to great lengths to produce signed statements that all excavators on this project were not involved in Dumbuck or Dumbowie. Yet it seems like his assurances only relate to the 1902 seasons, and the questionable pieces may have been excavated in 1901. More letters were written to the papers. In 1905, Munro went in for the kill. That year he published ‘Archaeology and False Antiquities’, about 400 pages that were, more or less, devoted to the idea that the finds at Dumbuck were a crock. Donnelly died shortly after this book came out and his son blamed this early death on stress caused by the controversy. At this point everyone accepts that the Dumbuck/Dumbowie/Langbank objects are fake. In an interesting twist, excavations at Dumbuck in 2000 turned up yet another of these pieces: Hales and Sands state that the site must have been ‘liberally salted’. The two also spend a bit of time trying to figure out who planted the pieces. The co-directors seem an obvious choice. They eliminate Miller as he died before excavation at Langbank commenced. They speculate that Bruce is unlikely due to his prominent role in later Scottish archaeology and thus the respect of his peers. They note that Donnelly was deeply distressed by the allegations to a degree perhaps not seen in someone who had perpetrated the fraud. But, really, who knows? It could have been one of them, all of them, or none of them. Whoever planted the pieces did so in a clever way and they were never really part of the canon of Scottish archaeological interpretation. Now they can just be enjoyed for what they are. Hale, Alex G.C. and Sands, Rob (2005) Controversy on the Clyde, Archaeologists, Fakes and Forgers: The Excavation of Dumbuck Crannog. 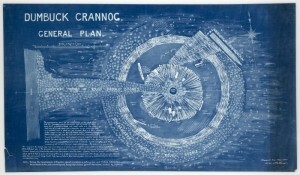 RCAHMS. Munro, Robert (1905) Archaeology and False Antiquities. London: Methuen & Company. Shinichi Fujimura admitting to planting artefacts at his site. Profimedia/AFP. Shinichi Fujimura was not an archaeologist by training, rather he was an archaeology enthusiast who worked for a manufacturing firm and slowly moved himself into the legit archaeology world. In 1975 Fujimura co-founded the NGO Sekki Bunka Kenkyukai which excavated a number of Japanese Palaeolithic sites, and later became senior director of the Tohoku Paleolithic Institute. All told, Fujimura participated in about 180 archaeological digs in Northern Japan, and was known as ‘Divine Hands’ for his uncanny ability to locate very ancient artefacts, usually while he was on his own. All of this went pretty well for Fujimura and he gained the support of a number of archaeologists who repeated his findings into the established academic literature. But then the rumblings started. Fujimura’s finds knocked back Paleolithic Japan over 30,000 years ago BUT the locations in which those ‘Divine Hands’ excavated such ancient objects just were not that old. To put it another way, geology did not support Fujimura’s archaeology. Furthermore, the artefacts themselves did not easily fit into the later sequence of artefacts. None of this made sense and, in the 1990s, real archaeologists started saying that. That said, some blamed Japan’s academic environment, particularly a lack of information sharing, for creating a system in which obvious fakes go undetected. Fujimura was still on it. At the Kamitakamori site near Tsukidate, Fujimura announced that his team had actually found potholes that he was dating to hundreds of thousands of years old. 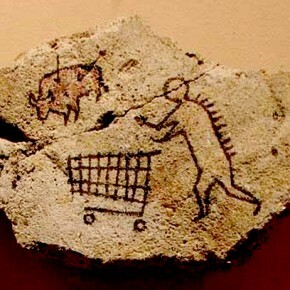 Proof of early Palaeolithic dwellings. 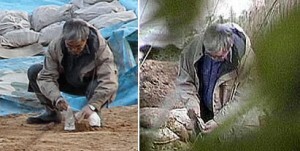 About a week later a newspaper announced that they had photos of Fujimura digging holes, plopping ‘artefacts in the holes’, and then having his team find the planted objects. The photos were taken the day before the 570k years news announcement. Fujimura folded instantly. He said that he would take artefacts from his collection and personally deposit them in much older strata. Yet Fujimura continued to claim that his earlier finds were authentic. “I did something that I shouldn’t have done”, said Fujimura. Fujimura planting artefacts at Kamitakamori. Then things turned very ugly. A magazine published a series of articles in 2001 alleging other artefacts were fakes and implicating Mitsuo Kagawa, an archaeologist at Beppu University. Kagawa doesn’t seem to be directly associated with Fujimura, rather the Fujimura scandal shone a light on academic analysis of the Japanese palaeolithic. In particular, the magazine focused on stone tools excavated in 1962 at Hijiridaki cave. 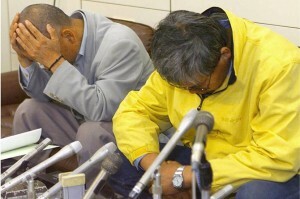 The elderly Kagawa then committed suicide, leaving a note that maintained his innocence. Kagawa’s family successfully sued the magazine for defamation in 2004. Fujimura’s admission has called much of what was ‘known’ about very early Japan into question. His finds were removed from museums throughout Japan and everyone had quite a big rethink and a re-evaluation about what evidence they really had. Other archaeologists associated with Fujimura found their lives to be ruined; quality archaeology so near to tainted archaeology becomes tainted as well. This one is a recent but classic case of what may have been funding and pressure. Located in the Basque Country, Veleia was a Late Roman town that was an important stop along the Roman Road running parallel to the Bay of Biscay. Eliseo Gil and Idoia Filloy began excavations there in 1994. In 2001 they started major excavations to re-explore previously excavated parts of the city. The Basque regional government, via the regional public train company, granted the site €3.72 million for excavation and investigation over 10 years, an amount of money that many would feel came with the expectation of notable finds. And notable finds there were. 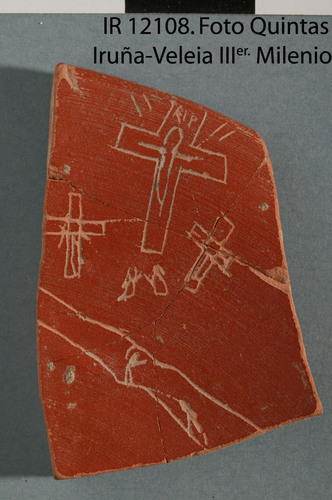 In June 2006 Eliseo Gil, the director of the archaeological project made a spectacular announcement: in 2005 and 2006 the project had uncovered hundreds of pottery sherds and some animal bones bearing astounding 3rd century graffiti. 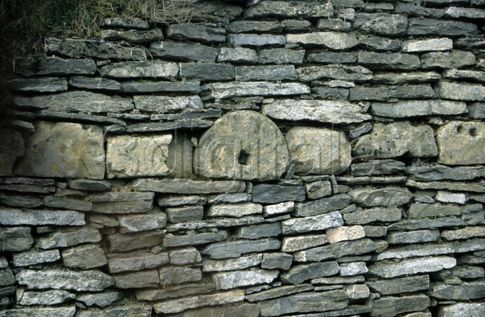 Gil told the world that the project had found the earliest evidence of written Basque, a finding that must have pleased the project’s funder. Next they announced that they had found sherds with Egyptian themes and Egyptian hieroglyphs on them which tied the Basque region to this appealing super power. And not just any Egyptian themes, some of the sherds bore the name of the famous Queen Nefertiti. Finally the project announced that they had found the oldest depiction of the crucifixion of Jesus, which fits in with a Basque self-image of devotion. €3.72 million well spent, right? Early scientific analysis of the objects looked promising. Yet, of course, there were questions. An initial look at the Basque showed it to be ‘too modern’ for the time period and the Latin had ‘odd grammar’. At least one Latin inscription reportedly had a comma. Within days of the announcement various scholars started officially voicing their doubts about the finds. The famous crucifixion sherd. Note the RIP. In May 2007 a new government took over in the province and the head of the culture department of this government decided to investigate this matter. A panel of 26 experts was assembled. They mulled over the evidence for a year, announced that they detected massive fraud. That is, every ‘expert’ except Gil declared the texts to be crude and incoherent fakes. And gosh were they ever fakes. The hieroglyphics were ‘a joke’. Much of the ‘Latin’ actually looked more like modern Spanish: Baco, not Bachus; Esculapio, not Aesculpius. The famous crucifixion scene had RIP written on the cross. Some of the scholars think that IISCAR on a list of philosophers was meant to be Descartes…a man that the forger didn’t seem to know was of the 17th century. The list goes on…and on…and on. The commission cost the public tens of thousands of euro. Archaeologists who quit the project as these allegations came to light have stated that the inscriptions were ‘discovered’ in the lab, not in the field, implying that while they excavated an authentic assemblage of sherds, the inscriptions were added later. 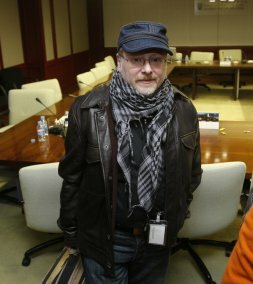 The regional government charged Gil with attack on national heritage and fraud. The public train company that funded the dig filed a separate lawsuit seeking the return of much of the funding they provided. This case has, characteristically, dragged on and on. In February of this year, Gil was still insisting on his innocence (and the authenticity of the pieces) as a Spanish court requested that he ‘assume responsibility’ for the forgeries.